On Saturday, September 17 at 1:00 p.m. ET, the Coastal Carolina Chanticleers will visit Sanford Stadium to face the Georgia Bulldogs. The game will be available on a pay-per-view basis for $34.99. Production of the game will be handled by CSS with the broadcast team of Bob Neal (play by play) and Buck Belue (color analyst). The game will also be shown on ESPN Gameplan and on ESPN3 at at WatchESPN.com. 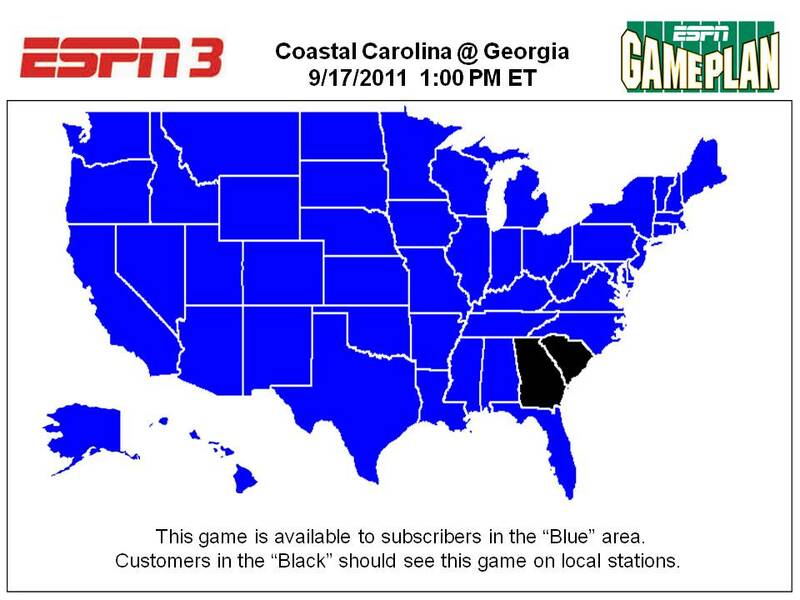 However, it will be blacked out in Georgia and South Carolina (blackout map). Residents of GA and SC will have to order it as a single pay-per-view event from your cable/satellite operator.